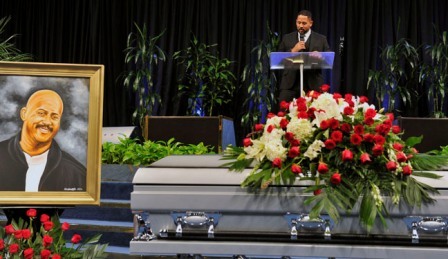 Celebrities, elected officials, community leaders and everyday citizens came to out Nov. 14 to Crenshaw Christian Center to bid farewell to South L.A. business owner E.J Jackson. Known throughout the city for his successful transportation operation, Jackson Limousines, he was also highly regarded for his wide-reaching humanitarian efforts that included his famous turkey giveaway, which distributed Thanksgiving dinners to more than 12,000 people last year. While many were still stunned by his sudden death from a heart attack on Nov. 1, it didn’t deter the 500+ attendees from joining Jackson’s children and relatives to celebrate his life, legacy and service to the community. Jackson was a long-time member of CCC and Apostle Frederick and Dr. Betty Price were in attendance, along with their daughter, Angela Evans. “We were so surprised to hear of the passing of Mr. Jackson. He made such a tremendous impact on the community, but now, he’s certainly in a better place,” said Dr. Betty before the service. 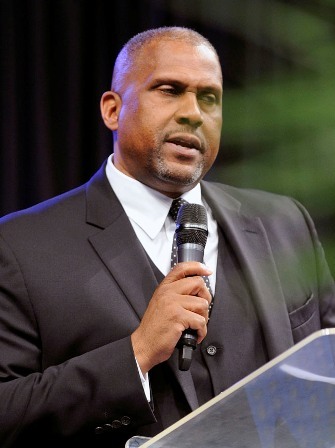 PBS broadcaster Tavis Smiley gave opening remarks, recalling the challenges Jackson faced and overcame as a small business owner. “I’m so glad E.J. lived for a cause and not because. To try to navigate as an African American business is not an easy thing to do. But, E.J. survived the big boys in the transportation game and he survived Uber,” said Smiley, who added that Jackson Limousine provided car service for Smiley’s celebrity guests appearing on his television show in exchange for advertising credit on the program. Smiley also commended Jackson for hiring formerly incarcerated people as drivers. “That’s loving and serving your community,” said Smiley. Speaking on behalf of his family, Jackson’s son declared, “Today, we are celebrating the life of a hero. God is not done using our father!” He also announced that the family, through its E.J. Jackson Foundation, plan to conduct this year’s turkey giveaway on Nov. 22. CCC Pastor Fred Price delivered an upbeat eulogy that urged the audience to celebrate Jackson’s life and find comfort in the word of God. “Brother E.J. was an awesome man. He had a great relationship with my family and with Crenshaw Christian Center. The majority of limousines that I’ve been in were his. I’m glad the family will continue the legacy of E.J.,” said Price. 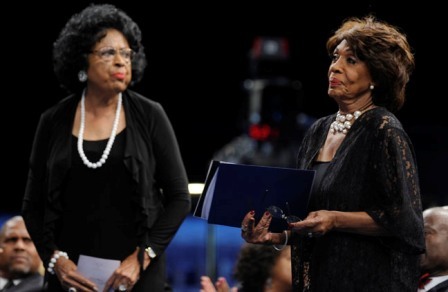 Congresswoman Maxine Waters and retired Congresswoman Diane Watson both reflected on their close relationship with Jackson and how much they looked forward to participating in the turkey giveaway that Jackson started in 1982. “Today, we celebrate the life and times of phenomenal humanitarian. He had a mission and he carried out his mission,” Waters said. “Every November, I was with him as we gave away the turkeys and everything that goes along with the turkeys, the vegetables, fruits and bread. It’s an experience everybody should have and I will be here Nov. 22. But, E.J. didn’t just help people in November. He helped them all year long, wherever people were in need and he inspired me,” she noted. 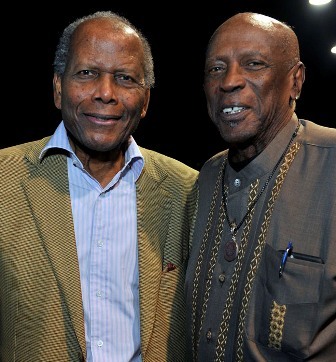 Inglewood Mayor James Butts and Inglewood Councilman James Dotson attend the service as well as actors Sidney Poitier, Lou Gossett, Jr., Hal Williams and Dawnn Lewis. Lewis shared how Jackson assisted her with finding a car service in New York City when her father passed away last year. “In less than 24 hours, he called me with a name and number, then said, ‘Don’t worry, I got this,’” Lewis said. Helping others was a characteristic Jackson displayed throughout his life. Born Ellsworth Cecil Jackson in Cleveland, Ohio, on May 23, 1950, he helped people carry their groceries as a child. He relocated to Los Angeles with his family in 1966. After graduation from Manual Arts High School on 1969, Jackson played football at Arizona State University and at Cal State Long Beach. Following college, he mounted several business ventures before deciding to launch a limousine service in 1978. With the help of his mother, Katherine Cecilia Jackson, he purchased his first limousine and grew his business over the years by providing exceptional customer service. His humanitarian efforts increased as well as he traveled to homeless encampments distributing food and water, assisted the poor and elderly and even met with gang leaders in the 1990s to discuss ways to ways that they could peacefully co-exist. Jackson is survived by his children, Charlece, Monye, Keisha, Billie, Randi, TyRon and Ellsworth Jr.; sisters, La’Nita Perry and Sondra Shorter; brother, John Jackson; and 11 grandchildren.